The Resurgam Trust which is based in Old Warren and has a remit covering the greater Lisburn area, raised a total of £2675 for their chosen charity and staff and volunteers proudly presented a cheque for this in the company of Brenda Hale, MLA for Lagan Valley. 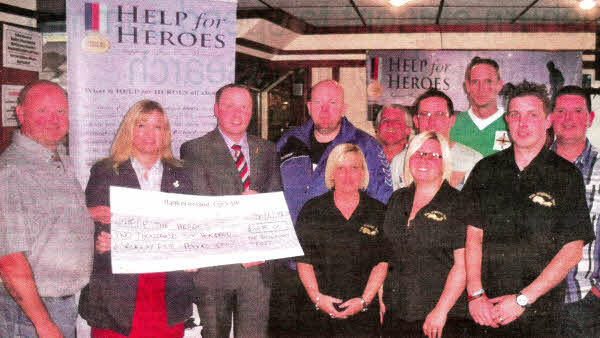 LISBURN based Resurgam Trust has presented a cheque to the Help for Heroes charity after organising a series of fundraising events. The Trust, which is based in Old Warren and has a remit covering the greater Lisburn area, raised a total of £2675 for the charity and staff and volunteers proudly presented a cheque for this in the company of Lagan Valley MLA Brenda Hale. Fundraising co-ordinator for the trust, Francis Ferris, commented: "We felt that our chosen charity best reflected the need of many in our local areas, as volunteers and staff at Resurgam have friends, neighbours and family members serving in the armed forces and many have completed recent tours of Afghanistan. In addition it's important to recognise the support we have received from Brenda Hale, who encouraged and attended many of the events." A series of activities was arranged by the group to maximise the donations including a sponsored hill walk, pool and darts competition, concerts by a local flute band, a weight loss club and most recently the Lisburn 10k & fun run. Mrs. Hale said: "I was honoured to be asked to present Resurgam's donation. It is encouraging when a community chooses to actively support a charity, and m this case a military charity. 'In a time of deep recession, charities need more support when it is much more difficult to give. Resurgam and the young people they work with have raised a substantial amount of money through various fundraisers, and as a recipient of support from a military charity it is extremely humbling to see the time and effort that has been afforded to this cause. "To know that our Armed Forces and their families have been not only remembered, but practically supported is uplifting and on behalf of army families I wish to thank Resurgam for their generous and much appreciated donation."